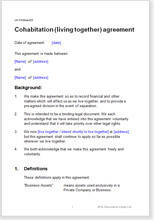 This cohabitation agreement template can be used to create a written record of understanding between the parties currently cohabiting or planning to do so in the future. The agreement allows you to agree on the distribution of finances, responsibilities and assets and the provision of child arrangements. This cohabitation agreement helps you to work out and set down all the practical arrangements that need to be covered when two people who are neither married nor civil partners, set up house. It helps you to set down all the arrangements that you need, both now and on a future separation. It does not try to tell you what is best for you, but to steer and guide you into considering and dealing with the most important issues. It covers arrangements about your home, business assets, who owns what, everything about money - and even provisional children arrangements. This document does not require any particular action after completion. Just print two copies, both of you sign both copies, date both with same date and each keep one. Your completed document is valid and binding at law until you are married or a child is born. You are bound by it. Use it at any stage of your relationship, before marriage. However, if you marry or enter a civil partnership in the future, the status of the document changes. It becomes like a pre-nuptial agreement. The effect is that if you then separate, the court will take this document into account, but will not be bound by it. You want to live together but also stay in control of your own company or business assets.